A visit to the Veolia waste management and recycling company site outside France’s capital Paris was an eye opener to the fact that when collected and recycled, garbage can turn out to be a very lucrative business. The privately owned company, Veolia’s Plessis Gassot center, is one of the biggest waste recycling and treatment centers in Europe turning garbage into a money minting venture. According to the site director Mr. Yann Fourreauthe, the Plessis Gassot center, a former quarry site, receives 3500 tons of waste materials every day. The rubbish is recycled to produce electric energy from biogas which is distributed on the national grid. The company earns 24,390 million Euros in revenue annually and boasts 163,226 employees worldwide. The non-dangerous waste include newspapers, plastics, tin cans metals, wood, tyres and glass, all of which are sorted and dumped in a huge pit and covered with sand to avoid papers and plastics flying away. Tractors are then driven over the site to reduce the volume of the rubbish. The garbage is then buried four meters deep in the ground where it is left to decompose. After decomposition pipes are fixed at the site to collect the biogas which is transferred to another site where it is distributed to the national grid. ”With that waste we produce biogas which is used to produce electricity which is injected in the French network,” said Remi Bougarel, Development director Veolia Africa. It is hard to smell any stench from the plant which Mr. Bougarel says is possible through treating waste. 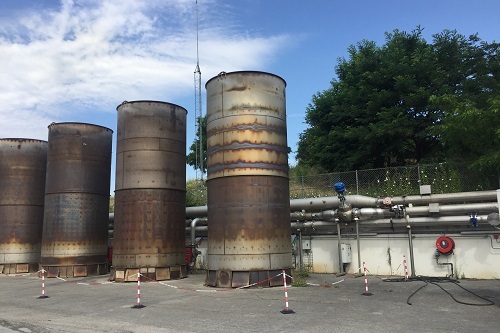 “There are only three very small villages around the plant, we are far away from the Paris dense areas, even when some smell arises in summer, we use dedicated products to treat the waste and spray the area with perfume,” he said. Patrick Couznet, Veolia CEO for Africa told this reporter during a visit to the company’s head office in Paris that this plant will treat waste water to ensure that there is no additional pollution of Lake Victoria from the Nakivubo channel and Kinawataka which are a major source of waste in Kampala. In addition, upon completion, the plant will also be treating sewage from Kampala.“Currently sewage from many properties in Kampala finds its way to the Nakivubo channel and Victoria Lake without being treated,” Mr. Couznet revealed. He named city sewers and the Nakivubo channel as the major sources of sewage. In June 2018 Veolia’s Water Technologies unit, specializing in water treatment,opened a new chemical blending facility in Johannesburg, South Africa. The facility will produce water treatment chemicals to address the demand for quality water treatment from both industries and municipalities. The facility has a maximum output capacity of 15,000 tons of water treatment chemicals annually. Veolia, a global leader in optimized resource management, designs and provides water, in addition to water and energy management solutions for sustainable development of communities and industries.